“Balclofen/Naltrexone Combination Therapy for suppressing Binge Eating of Palatable Food” UF#-13854; filed December 14, 2011, (Avena and Gold). 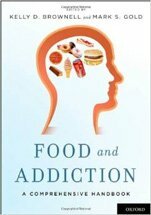 Compositions for Controlling Food Intake and Uses Therefor (Mark S. Gold and Nicole M. Avena). Patent # 9,610,285 B2. Issued April 4, 2017.